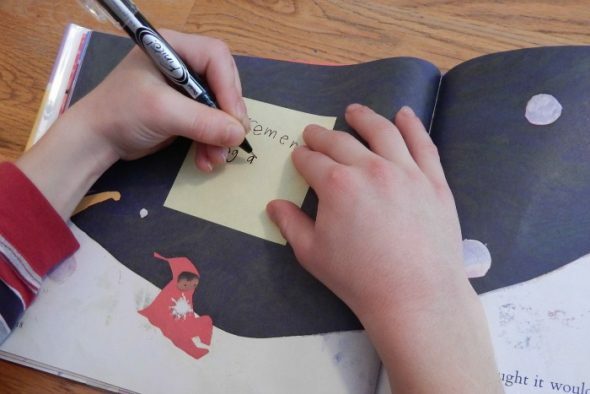 Last week, in our reading comprehension series, This Reading Mama wrote about teaching children to use their schema to understand what they read. Everyone brings a different schema to the books they read, because schema is your background knowledge. It’s shaped by your experiences, the people you know, and the books you’ve read. 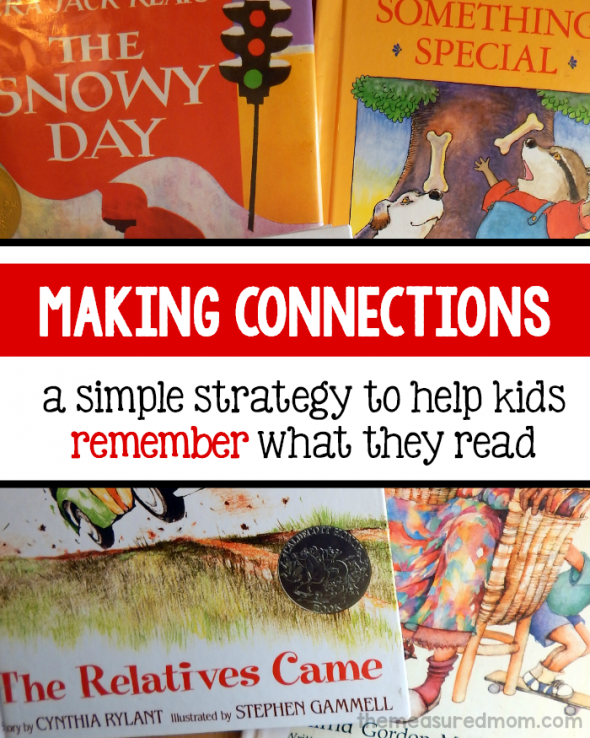 Today we’re tackling another reading comprehension strategy: making connections. I’ll show you how to help your child or students make connections from their own lives to what’s in the text. 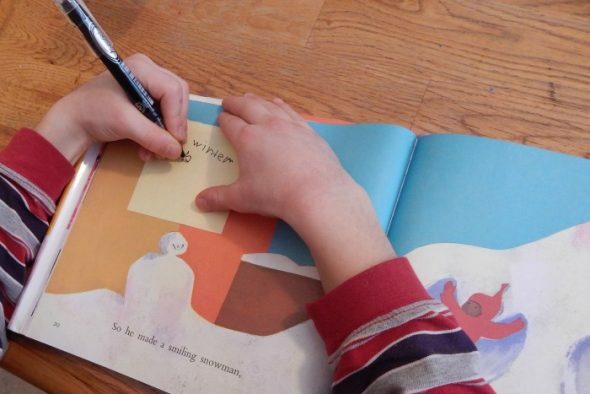 This simple strategy goes a long way in helping them understand and remember what they read. When we talk about making connections, we usually think about three types. Today we’ll talk about the simplest and most natural one to teach: text to self. 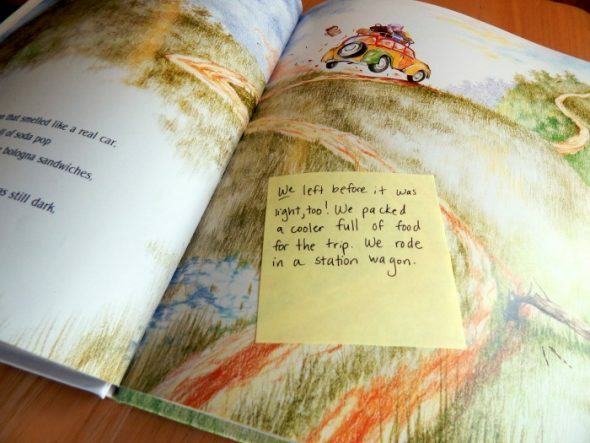 When children make connections between a book and their own lives, they feel empathy for the characters and become invested in the story. They have an easier time remembering the story when they feel a personal connection. Later, kids begin to make connections between books they’ve read. Eventually they’ll be making connections to the world. This opens the door to some big concepts and understandings. 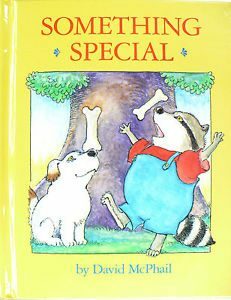 I knew right away what book I would use to teach my son how to make personal connections. I chose Cynthia Rylant’s The Relatives Came, an instant favorite the first time I read it because of how much it reminds me so much of my own childhood. Today I want to show you a strategy that good readers use to help them understand and remember what they read. While they’re reading, they make connections from the book to their own life. This can help them understand the characters and be more interested in the story. I’m going to show you how to use this strategy with one of my favorite books. It’s called “The Relatives Came.” The first time I read it, I couldn’t believe how much it reminded me of my own life! Normally when I read, I think inside my head. But I want to help you understand what I’m thinking. When I read from the book, I’m going to hold it up like this. When I set it down, I’ll be thinking out loud about what it reminds me of. Are you ready? I put the book down. 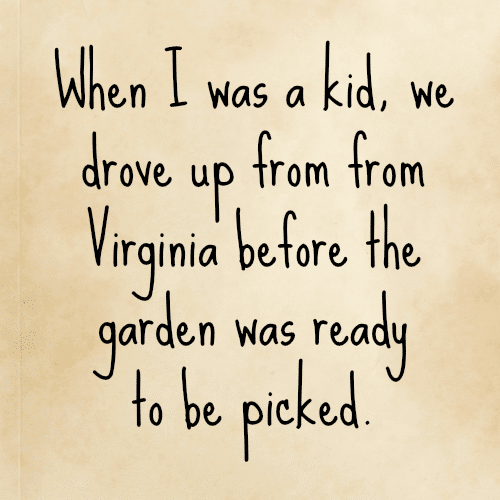 “This family is from Virginia just like mine was! Every other summer we took a long drive up north to see Grandma and Grandpa and all our cousins.” Then I wrote my personal connection on a post-it note. I put down the book. “I know just how they feel, leaving early in the morning, because my dad would always wake us up really early when it was still dark. We’d curl up in the station wagon with blankets and fall back asleep.” I wrote my connection. As I read through the book, I stopped several more times to make connections and post them in the book. Now it was time for my son to have a turn. Let’s look at a book you’ve read before . It’s about Peter and the day he gets to play in the snow. As you read it aloud, stop to think about connections to your own life. You can write them on these post-it notes. Page after page, he denied any connections to the story. I was about to give up when he turned the page and read about Peter and a snowball fight. Now he was enjoying himself! We read one more book. After we worked together to make connections, I brought out a simple printable. 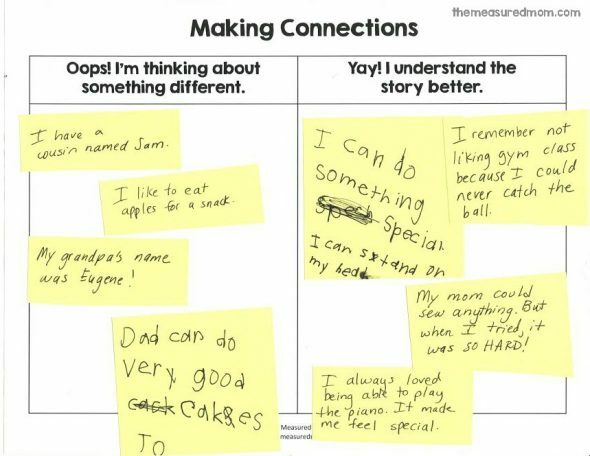 We pulled out each of the post-it notes and talked about whether they helped us understand the story better or just made us think about something else. Here’s what we came up with. This simple extension really got us thinking deeply! The lesson as I’ve described it is great for kids in first through fourth grade. But younger children can make connections verbally or by watching you write them down for them. 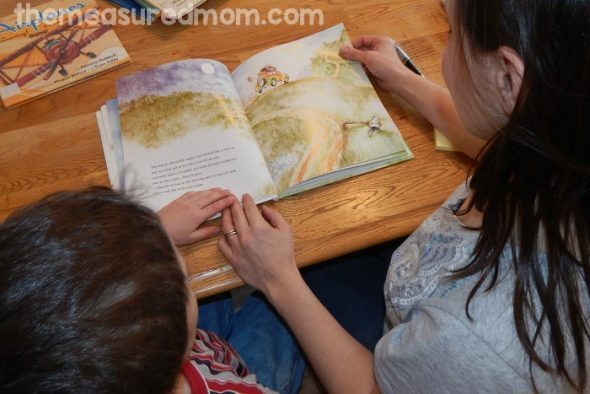 As you read to your toddler, preschooler, or kindergartner, pause to let your child make connections. Be sure to make some of your own. You’ll probably find that preschoolers are exceptionally good at making distracting connections. 😉 Encourage any sort of connection until your child is mature enough to distinguish meaningful connections from those which are not. Recommended picture books for teaching kids to make connections. Realistic fiction (even with animal characters) or memoirs are perfect for helping children make connections. Choose a book with a character your child can relate to. Here are some possibilities. Koala Lou, by Mem Fox. A little girl koala feels neglected and unloved by her mom who is busy with younger siblings. Chrysanthemum, by Kevin Henkes. A little girl mouse is made fun of because of her long name. Owen, by Kevin Henkes. Owen has a special attachment to his blanket, but his parents want him to let go of it before he starts school. Ira Sleeps Over,by Bernard Waber. Ira is embarrassed to tell his friend that he still sleeps with a teddy bear. Amazing Grace, by Mary Hoffman. Grace dreams of playing the lead role in Peter Pan. But her classmates tell her she can’t because she’s a girl and because she’s black. Stand Tall, Molly Lou Melon, by Patty Lovell. Molly Lou Melon is a tiny, spunky girl who is bullied because she is different from the other kids. Lilly’s Purple Plastic Purse, by Kevin Henkes. Lily’s toy is confiscated when she plays with it during the school day. She becomes very angry with her teacher and does something she later regrets. 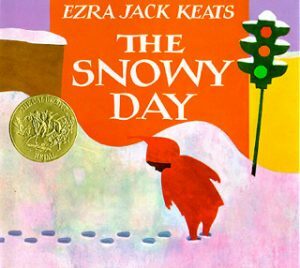 The Snowy Day, by Ezra Jack Keats. A boy enjoys playing in the snow. Check out the rest of our series! Thanks, Becky! I love how this series is getting me to think deeply about comprehension and how to teach it. Hi I am so pleased to find your page. 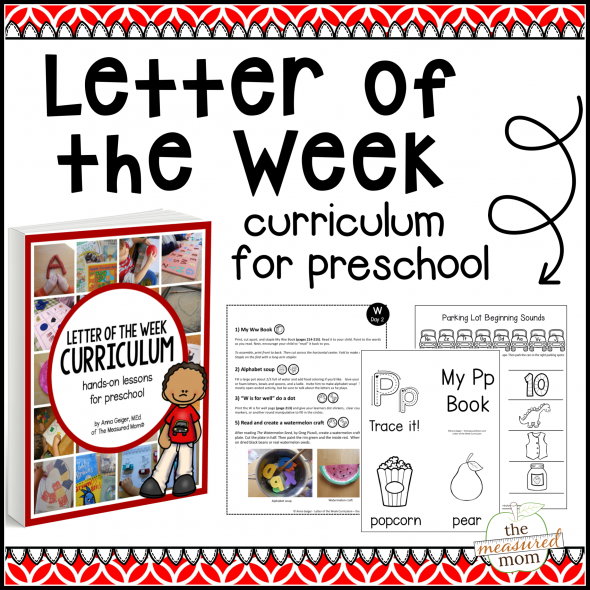 I found you at pinterest thru stemmom.org Both of you ladies are simply inspirational. I am a home schooling mom. I have heard about the STEM program, I have looking everywhere for information about it. This is so awesomely (is that a real word?!) simple! I can also see it used in the classroom with small groups, using the printable on a flip chart and letting children help each other decide if it it content related or not. And for non-writers (younger ones) the teacher could write it on the chart. Find something valuable every time I visit! Thanks so much! Love this post! I especially like the part on the chart for the off topic connections! Through my newspaper column in local papers (SUPPORTING SUPER STUDENTS) I try to help parents, grandparents and kid caregivers to help their children learn. Your information is so valuable to them. I like to refer to your blog and your invaluable ideas about learning. Word skills are foundational, but your comprehension ideas are great! Keep up your connections and valuable thinking, especially communicating them to parents and teachers. Thanks so much for sharing, Bette! Thank you so much for getting these strategies out into so many classrooms and homes. As a literacy coordinator and K-2 teacher of many years I love seeing great literacy pedagogy instead of comprehension stencils!! We (district/state) have been using these (supposed to anyway!) for a number of years, but even now not everyone is using them yet! Thank you for your kind comment on our reading comprehension series, Vanessa! 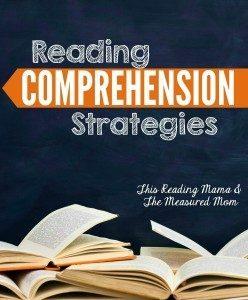 If you have time, I’d love to get your input on future reading comprehension resources. If you get a chance, you can email me at anna@themeasuredmom.com. Thanks! So helpful? Thank you for sharing!